With a 35,000 square foot air-conditioned facility, FM Machine Co. features and array of state of the art equipment to meet all your precision machining needs. 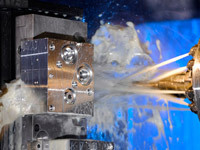 We specialize in lower volume runs of high precision machining, prototype components and complete assemblies. We incorporate our machining knowledge and engineering skills with your design/concept to provide a cost-effective outcome for our customers. Please contact FM Machine Co. to learn more about how we can help with your precision needs. We maintain tolerances as close as .000050” (fifty millionths of an inch) on our CNC OD/ID grinders and surface grinders. Chevalier FSG-2060ADII X 59" Y 20" Z 20" L 60" W 20"
Chevalier FSG-1640AD X 40" Y 16" Z 16" L 40" W 16"
Brown & Sharpe #13 X 12" Y 6" Z 6" L 12" W 6"
Our CNC mills, with our 4th axis capabilities, can also maintain sizes, squareness and parallelism to within .0002”. Our CNC lathes maintain sizes and a T.I.R. (total indicator reading) of .0002” on a consistent basis up to 28” on diameter.